Registered to fill up the Stratford on Avon OBCZ. Reissued in new covers, this is the book that tells of the selfish gene. It is a world of savage competition, ruthless exploitation, and deceit. But what of the acts of apparent altruism in nature the bees who commit suicide when they sting to protect the hive, for example? 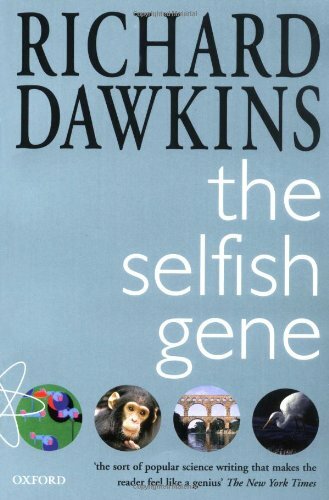 Professor Dawkins holds out the hope that our species has the power to rebel against the designs of the selfish gene. This is Richard Dawkins' first and most famous book, selling over a million copies worldwide so far, and translated into 21 languages. This book was still lying next to my bed, while I was under the impression that I had registered its safe arrival. Not! I am sorry! I was kind of caught up in the arrangements around our wedding this week. I will start reading this soon, there are already people lining up for it when I have finished. Thank you, Netstation, and for the lovely card that came with it! Well, I tried and tried but I simply can't read past Dawkins' pride, sense of self-importance and annoying attitude. True, I have learnt a lot from the first half of this book. Now I will give it to my friend and fellow bookcrosser papaver, who has been drooling over this one for months. Edit: a ring might form. I want to give it another chance, but Impuls will read it first, after Papaver. This was on it's way to Papaver, but somehow ended up on my bedside-table. I'll pass it on when i've finished it. Oops, it seems this book has been sitting on my bedside table for six months now. And worse, although I rather liked it I still haven't finished it. Maybe this is because this book really isn't bedtime-reading material? Anyway, I've got a new strategy: I've passed it on to Papaver, who will read it & tell me all about it. Not bad, huh? I brought it home with me from Papaver's house yesterday. I want to give it another try. We have been discussing this book several times though, it has hardly been gathering dust in a forgotten corner. It was requested by another bookcrosser from New Zealand. I sent it off yesterday, now that the postal strikes are over and the Christmas card rush is done. Happy reading! Thank you! It has arrived safely. It was a really interesting read, and it was good to go over topics again just before lectures start. Thanks for this book! I'll pass it on to some other biology students who may be interested in reading this book. Then I'll most likely start an international bookray with it. Very interesting, but felt that I was back in evolution [lecture] days again. Gone off as a surprise RABCK/ HGG book. Arrived safely in the mail today. Thanx a bunch!